SuperGold! Headliners in Concert features 6 unbelievable performers impersonating your favorite superstars from yesterday and today. No lip-syncing here. All vocals are live and in person. With SuperGold! 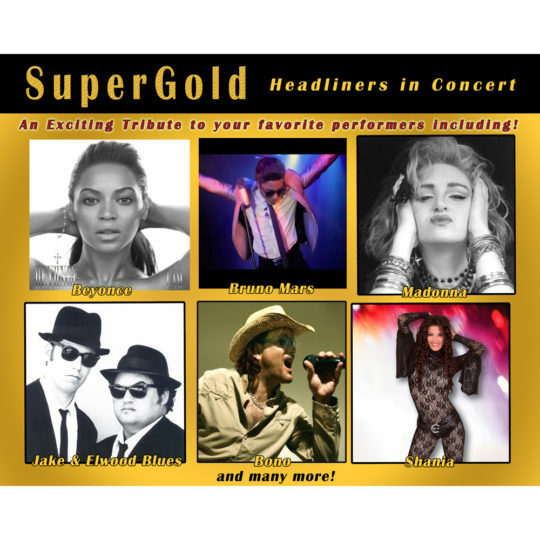 You can also provide your guests with two full hours of the best party music from the talented SuperGold! band. Add 6 high-energy costumed dancers to interact with your audience and this show will rival any production you’ve seen in Las Vegas!